Granite is a hard, tough, igneous rock that is widely distributed in the Earth's continental crust. It is medium- to coarse-grained and consists of a number of minerals, especially members of the feldspar group and quartz. It varies in composition and comes in a range of colors, such as white, pink, buff, gray, and black, often occurring in combination. Given its ruggedness and wide distribution, it has been used as a construction stone since antiquity. For example, it was used to build some of the pyramids of ancient Egypt and temples of ancient southern India. Today, granite continues to be used as a dimension stone (stone available in large quantities cut to specific sizes) in buildings and monuments. In addition, given its strength and aesthetic appeal, it is used for kitchen countertops and flooring tiles. Polished granite stones are used in the team sport known as curling. The word granite comes from the Latin granum, for grain, referring to the common, coarse-grained structure for this type of crystalline rock. In geology, granite is called an intrusive, igneous rock. An igneous rock is one that is formed when molten rock (magma) cools and solidifies. The term "intrusive" indicates that the rock solidified below the Earth's surface after it first intruded into other rocks. The average density of granite is 2.75 g•cm−3 with a range of 1.74 g•cm−3 to 2.80 g•cm−3. Granite is currently known only on Earth, where it forms a major part of the continental crust. It has been found as relatively small (less than 100 km2 ), stock-like masses and also as huge formations called "batholiths," often associated with mountain ranges formed by "orogeny" (the mountain-forming processes of plate tectonics). Most granite intrusions are emplaced at depths from 1.5 - 50 km (.9 - 30 miles) in the continental crust. Small dikes of granitic composition called "aplites" are associated with granite margins. Granite has been intruded into the Earth's crust during all geologic periods; much of it is of Precambrian age. The origin of granite is contentious and has led to varied schemes of classification. There is a French scheme, a British scheme, and an American scheme. This confusion arises because the classification schemes define granite by different means. The "alphabet-soup" classification is often used because it classifies granite based on origin of the "parental" magma from which the granite was formed. As magma in the Earth's crust cools, it undergoes the process of "fractional crystallization"—a process by which some minerals crystallize before others. This process enriches the melt in silicon, aluminum, and potassium (the major constituents of granite), and lowers the content of iron, magnesium, titanium, calcium, and sodium. This process operates regardless of the chemistry and origin of the magma, but it leaves geochemical and mineralogical evidence of the composition and origin of the parental magma from which granite was formed. The final mineralogy, texture, and chemical composition of a granite are often distinctive, based on its origin. For instance, a granite formed from melted sediments will contain more alkali feldspar (oligoclase), whereas a granite derived from melted basalt will be richer in plagioclase feldspar. Modern classification schemes are built on this basis. The "alphabet soup" scheme of Chappell and White was proposed initially to divide granites into "I-type" (igneous protolith) and "S-type" (sedimentary protolith). Both of these types of granite were formed by the melting of precursor rock called the protolith. Later, "M-type" (mantle-derived) granite was proposed, to cover granites that clearly arose from magmas sourced from the mantle. This type of granite is rare. "A-type" (or anorogenic) granites are formed above volcanic "hot spot" activity and have a peculiar mineralogy and geochemistry. These granites are formed by melting of the lower crust under conditions that are usually extremely dry. An example of an A-type granite is a caldera at Yellowstone National Park. The granitization theory states that granite (or some types of granite) is formed in place by extreme metamorphism—that is, the solid-state recrystallization of pre-existing rock, under conditions of extreme heat and pressure. The production of granite by metamorphic heat is difficult, but it is observed to occur in certain amphibolite and granulite terrains. These rocks are technically not granite as they do not actually intrude into other rocks. Granite comprises a number of minerals, primarily orthoclase and plagioclase feldspars, quartz, hornblende, and muscovite or biotite micas. In addition, it contains minor amounts of other minerals, such as magnetite, garnet, zircon, and apatite. On rare occasions, a pyroxene is present. 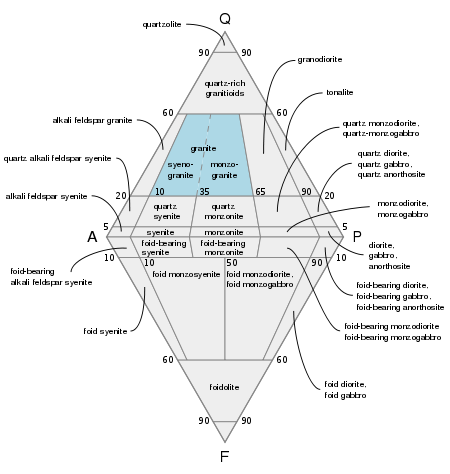 The naming of various types of granite is based on their mineralogic composition, using what is called the "QAPF diagram" for coarse-grained plutonic rocks (granitoids). QAPF is an acronym for four mineral groups: Quartz, Alkali feldspar (orthoclase), Plagioclase feldspar, and Feldspathoid (foid). Plutonic rocks are rocks formed when magma solidifies underground (see the QAPF diagram on the right). According to modern petrology, true granite contains both plagioclase and orthoclase feldspars. When a granitoid is extremely rich in orthoclase, the rock is referred to as alkali granite. If quartz is either absent or present in relatively small amounts (under five percent), the rock is called syenite. A granite containing both muscovite and biotite micas is called a binary or "two-mica" granite. Two-mica granites are typically high in potassium and low in plagioclase. For over a century, geologists have been grappling with the problem of how large volumes of molten rock are emplaced within the solid Earth. This problem has still not been entirely resolved. Granite magma must make room for itself or be intruded into other rocks, and several mechanisms have been proposed to explain how large batholiths have been emplaced. Stoping: The granite cracks the wall rocks and pushes upward as it removes blocks of the overlying crust. 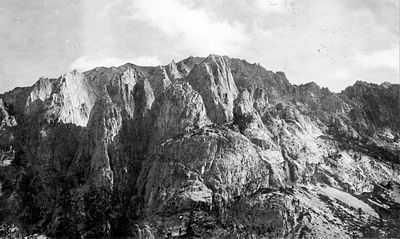 Diapirism: The granite of lower density causes relative buoyancy and pushes upward, warping and folding the rock above it. Assimilation: The granite melts its way up into the crust, thereby removing overlying material. Inflation: The granite body inflates under pressure and is injected into position. Most geologists today accept that a combination of these processes may operate to produce granite intrusions, as no single mechanism provides an adequate explanation. The Red Pyramid of ancient Egypt (about twenty-sixth century B.C.E. ), named for the light crimson hue of its exposed granite surfaces, is the third largest of Egyptian pyramids. Menkaure's Pyramid, likely dating to the same era, was constructed of limestone and granite blocks. The Great Pyramid of Giza (about 2580 B.C.E.) contains a huge granite sarcophagus fashioned of red Aswan granite. The mostly ruined Black Pyramid dating from the reign of Amenemhat III, once had a polished granite pyramidion or capstone, now on display in the main hall of the Egyptian Museum in Cairo. Other uses of granite in ancient Egypt include columns, door lintels, sills, jambs, and wall and floor veneer. How the Egyptians worked the solid granite is still a matter of debate. Dr. Patrick Hunt has postulated that the Egyptians used emery, which has greater hardness on the Mohs scale. Many large Hindu temples in southern India, particularly those built by the eleventh-century king Rajaraja Chola I, were made of granite. The amount of granite in them is said to be comparable to that used in the Great Pyramid of Giza. Granite has been extensively used as a dimension stone and as flooring tiles in public and commercial buildings and monuments. Given the problem of acid rain in parts of the world, granite has begun to supplant marble as a monument material, because it is much more durable. The Black Galaxy granites from the Cheemakurthy area of Andhra Pradesh, India, are renowned for their elegance. Polished granite has become a popular choice for kitchen countertops, given its high durability and aesthetic qualities. Engineers have traditionally used polished granite surfaces to establish a plane of reference, because they are relatively impervious and inflexible. The team sport called "curling" uses stones that are traditionally made of polished granite. Sandblasted concrete with a heavy aggregate content has an appearance similar to rough granite and is often used as a substitute when use of real granite is impractical. ↑ Shackleton, E. H. (1971). Lakeland Geology, 3rd edition, Clapham (via Lancaster): Dalesman. ↑ Harrell, James A. Preliminary Description of Stone Varieties Used in Medieval Islamic Buildings of Cairo, Egypt. University of Toledo. Retrieved June 12, 2007. ↑ Corbin, Nancy. Egyptian Genius: Stoneworking for Eternity. American Research Center in Egypt, Northern California Chapter. Retrieved June 12, 2007. ↑ “The Lost Temples of India.” Discovery. Available online at Google Video. Retrieved June 12, 2007. The Emplacement and Origin of Granite by Rob Kanen. This page was last modified on 10 July 2017, at 23:54.